Having visited Germany, Spain, Belgium and Italy, the World KF1 Championship is about to end in Japan on 10-13 November at the circuit of Suzuka, which many Drivers rate as one of their favourite tracks. And quite recently, recalling his Karting memories Jenson Button described the Suzuka course as the best one. The current McLaren F1 Driver distinguished himself there in 1996 by claiming third place in the World Cup for Formula A. 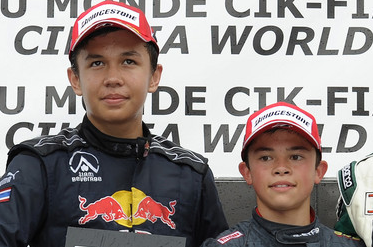 Although four of them can still dream of winning the title from a mathematical viewpoint, the main favourites are tipped as being two of the competition’s youngest Drivers, and judging by their supports (McLaren for one, Red Bull for the other) they are also likely to have a great career in Motorsport ahead of them, namely the Dutchman Nyck de Vries (Zanardi-Parilla) and Britain’s Alexander Albon (Intrepid-TM). Somewhat further down in the classification but still in with a little hope are Team Tony Kart’s Italians Flavio Camponeschi and Ignazio d’Agosto. Further to the decision pronounced a few days ago by the International Court of Appeal after the incident which occurred in the Belgian event between de Vries and Camponeschi, the gap separating the two leaders now stands at 18 points. Depending on the different possible decisions, it could have been 30 or 5, each time to the advantage of Nyck de Vries on Alexander Albon. But what are 18 points when 75 are allocated at each event? More especially as the Drivers who took part in the season’s first four events will share the starting grid with new opponents since ten Japanese Drivers are entered and will be determined to shine in front of their public on the occasion of this maiden World Championship held on their home ground. Although it was very prestigious, the Suzuka event indeed only had World Cup status until now. In addition to the 4 races counting towards the World KF1 Championship (2 races on the Saturday and 2 on the Sunday), the schedule of the meeting includes the CIK-FIA Asia-Pacific KF2 Championship held over one single-event. Its field will be very strong, with 36 participants comprising a selection of Japan’s best Drivers opposed to a few other Asian racers well-versed in international competitions (like the Thai Tanart Sathienthirakul at the wheel of a Tony Kart-TM-Dunlop and the Indonesian Gelael Sean at that of an FA Kart-Vortex-Vega), to the 2010 Australian Champion Cian Fothergill (Kosmic-Vortex-Bridgestone) and to a solid European delegation with Denmark as the predominant nation comprising Nicolaj Moller Madsen (FA Kart-TM-Vega), Michelle Gatting (Birel-BMB-Vega) and Max Klinkby-Silver (Birel-BMB-Vega).